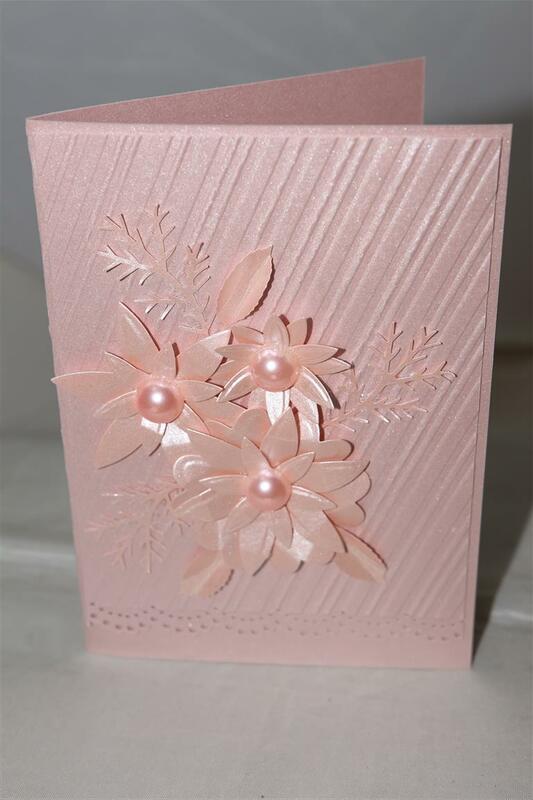 I came up with this card at short notice for a lesson.I used pearlescent cardstock ( for the card base) and pearlescent paper in the same shade of pink for all the embossing and die cutting. punches used – martha stewart lacy border, leaf, and branch , and the flower die is a new release from kaisercraft. 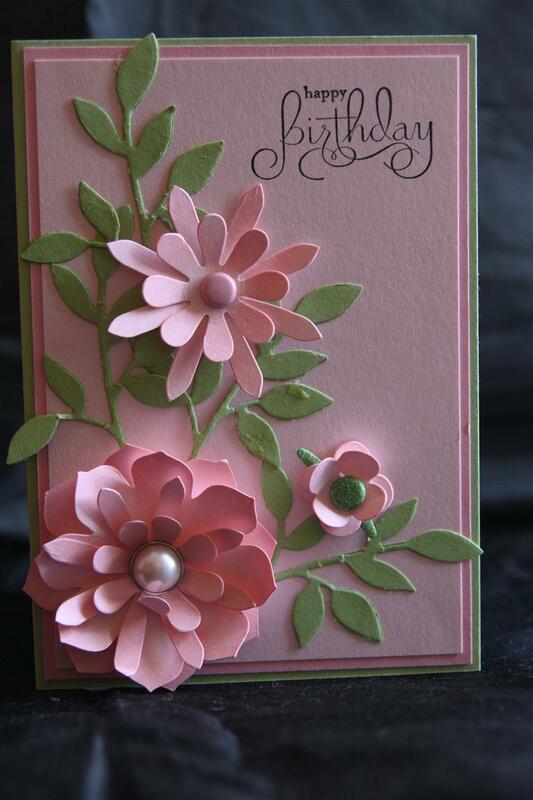 I added flat backed pearls in the centre of the flowers. This card was actually so simple, but looks really effective in real life with the shimmery card and paper. A gorgeous day here in adelaide, so we are all off to a bbq lunch in the park..must dig out my sunscreen and hat, at 29degrees celsius our winter skin may get a little burnt! til tomorrow…. welcome to flash back thursday! A short series of most popular cards I have posted on my blog! This one is actually more popular than the previuos flash back card, because it was made a couple of years later, and has had the same amount of views and pins etc..It’s all punching and embossing folders ( are we seeing a theme here? 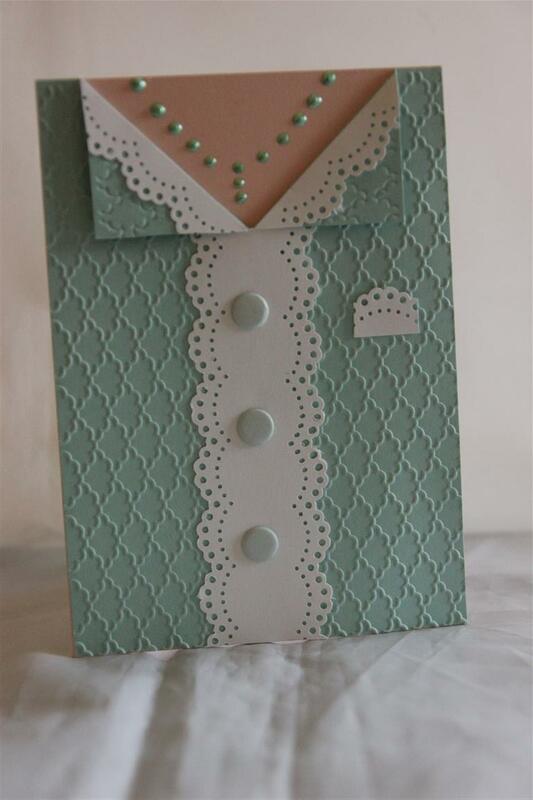 )The embossing folder is a stampin up folder, but a lot of the newer folders I have seen would give the same effect,and the lacy cardigan bits are made with my martha stewart lace doily punch.the card base was made with a pale pink cardstock to give the illusion of skin when the green cardstock was folded back.Til tomorrow…. Todays card is a really good basic design that leaves lots of room for improvising. 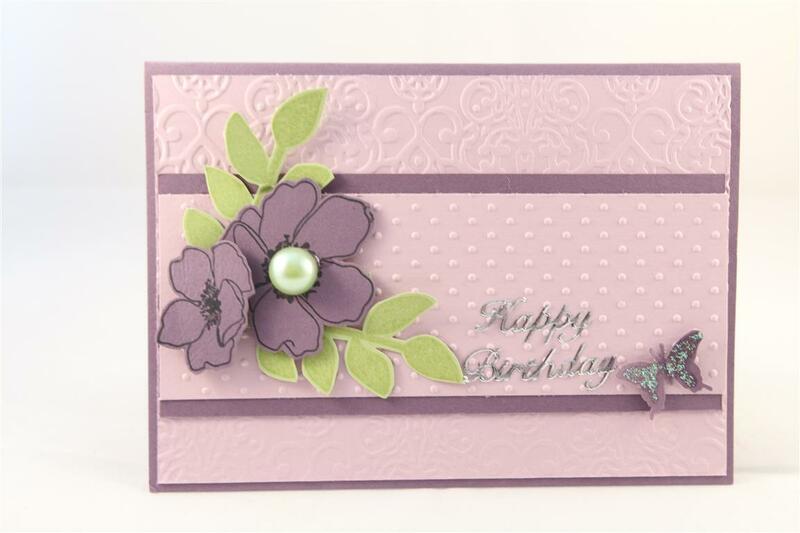 I have layered two shades of purple cardstock, embossing the layers with two different embossing folders and stamped flowers from stampin up fabulous florets stamp set onto more cardstock – no colouring. The leaves are stamped onto green cardstock ( they are stamped using stampin up secret garden stamp) and then all the stamping is fussy cut. if you don’t want to use stamps it would look just as effective with flowers fussy cut from patterned paper or shop bought flowers instead. I used a big green flat backed pearl in the middle of my flower. The butterfly is punched with a martha stewart punch. Til tomorrow…..
Todays card is a very quick and simple layered card, and one which I did for a retirement village lesson. 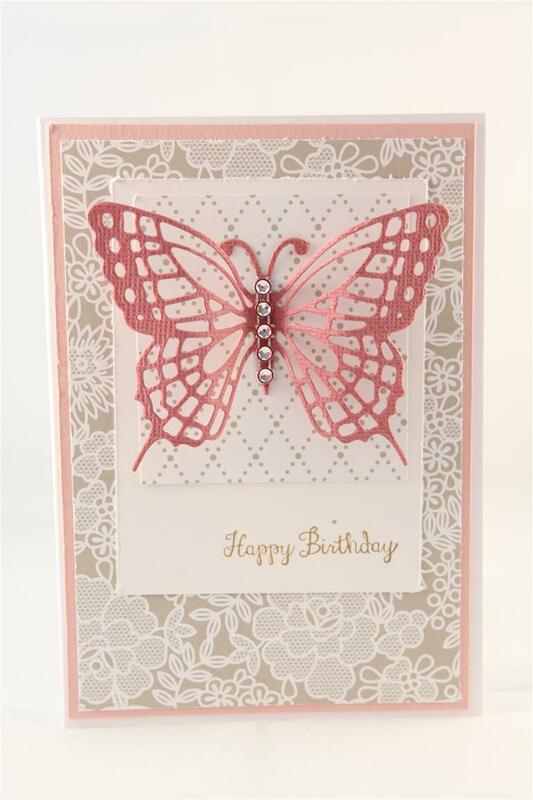 All the papers and cardstock used here are from stampin up but any paper collection would work with this design.So we have the base card and then 4 layers alternating pattern and plain.I die cut a beautiful butterfly and added a strip of rhinestones down its body to finish.I hope you have all had a lovely crafty weekend..til tomorrow…..
Every year one of the first Christmas cards I make is with this stamp set from Stampin Up called A wish for Peace. It’s quite a few years old, but I like the challenge of finding something new to do with it every year. 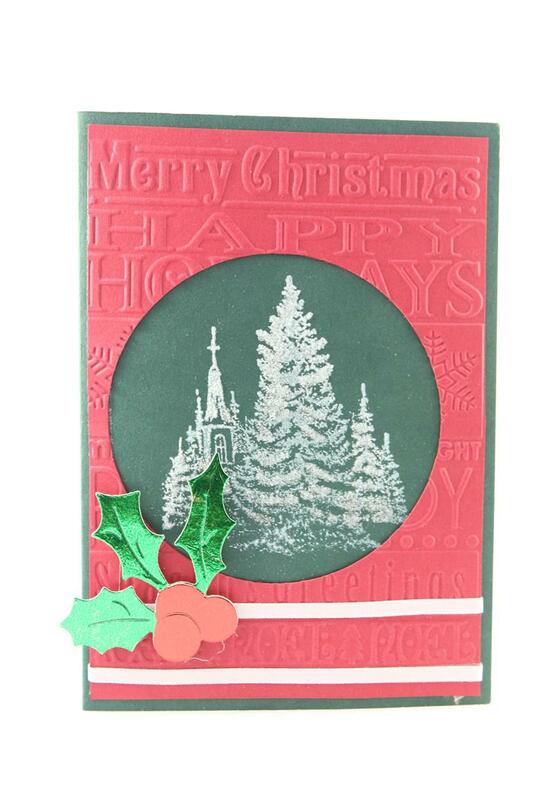 This year I used Stampin up cardstock and embossed the top layer with a cuttlebug Christmas folder after die cutting a circle from the middle of it. I stamped the image on the base card, and added lots of glitter to it once the ink had dried.The holly was die cut with a sizzix die. This was a simple make and would work with lots of my Christmas stamps.A few christmas items trickling through now, and I have spent all weekend working with Kaisercraft silver bells paper collection – My favourite so far this year! til tomorrow….